Another year and another C++ Status! It’s hard to believe, but it’s my fifth time I am writing this summary. And, as usually, C++ language is very alive. The biggest news for the year? Of course, it must be: the final draft for C++17!. What else have happened? See my full report below. January 14, Alex Stephanow is retiring. November 16, VS 2017 RC available! Before we dive into newest stuff, let’s recall what’s the status of C++11 and C++14 implementation. Visual Studio (as of current VS 15.0 RC) lacks some features: Expression SFINAE (Partial), Two-phase name lookup, C99 preprocessor (Partial). See this VS blog post for more information. Still, I don’t see that situation as a blocker. Let’s now focus on the main topic from this year. During the ISO meeting in Oulu (June), the Committee accepted the draft for C++17. This is definitely not a minor release since a lot of features were added! Update: I’ve made a separate post about all the features, look here. SO: What are the new features in C++17? Not much to be honest… Fortunately, most of the really desired features are close to being standardized, so it’s good sign for C++20. Still, other people aren’t such harsh for C++, Phil Nash: C++17 - Why it’s better than you might think. I think that C++17 is a decent release. We could always have more, but the committee did a good job this year anyway. If you’re unhappy about not having concept, ranges, modules in the standard… you can still play with their experimental versions! There were three committee meetings this year. 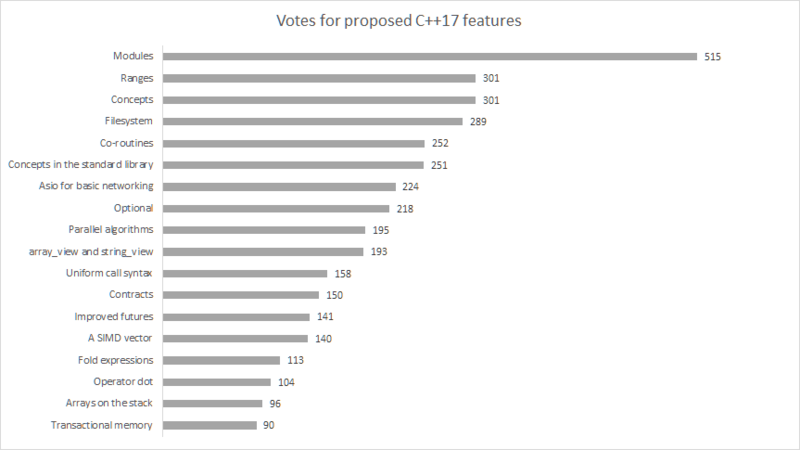 The most important meeting this year, they voted the C++17 draft! The best resource to stay up to date with all the features and compiler releases is probably: cppreference.com/C++ compiler support. But you can check out the recent RC candidate for VS 2017: Visual Studio 2017 Release Candidate. C++ Concepts are now supported when running in the GNU++1z/C++1z mode. The libstdc++ library has experimental C++17 support for a number of new features along with an experimental implementation of the File System TS and the 2nd Library Fundamentals TS. On Windows you can use the latest MinGW distro from nuwen.net (Stephan T. Lavavej): Nuwen MinGW distro updated with GCC 6.3 and Boost 1.63. Clang has its implementation of modules; you can play with it here. 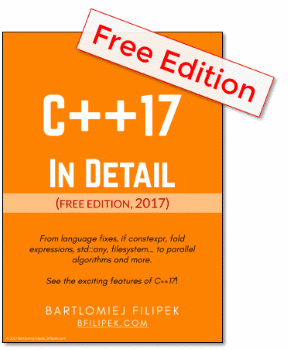 C++17 Features Supported by Intel® C++ Compiler - a bit outdated? As usually, we had two main C++ conferences - CppCon and Meeting C++, but I’d like to mention another one where C++ was the core topic - code::dive from Wroclaw, PL. Plus, there’s NDC Oslo with a good set of talks as well. This year the conference took two days, and it included a lot of talks about C++ and native development. Some of the presenters: Scott Meyers, Venkat Subramaniam, Andrei Alexandrescu, Dan Sacks, Ulrich Drepper, Michael Wong, Chandler Carruth, Sean Parent, and much more! Speakers: Andrei Alexandrescu, Anthony Williams, Dan Saks, Detlef Vollmann, Mark Isaacson, and more. BTW: The main problem with the conferences: how to watch all of those valuable talks! :) One tip is to watch it at bigger speed (1.5x, 2.0x, …) in the player, but still, it requires a lot of time! I think that C++ developers were looking for much more with C++17. In 2015 we got a lot of promises, ideas about the new standard, so people started to dream too much. The reality appeared a bit different, a lot of those impressive features were not accepted or put on hold. Still, we shouldn’t complain. C++ 17 will be a really decent release, and a lot of teams and companies are not even near accepting/using C++11. The adaptation is also an important factor when looking at the language use. It’s much better to have reliable, verified, checked features than something fragile that might change. I’d like to have concepts, ranges, modules soon… but C++20 is not that far. And yet I can play with those features using their quite stable experimental versions. I’m glad to see that the committee is working consistently, and also quite transparently. You can feel the enormous community behind the language. So, all in all I think 2017 will be a good year for C++. What do you think about C++ in 2016? The poll below: what's your favourite C++17 feature?